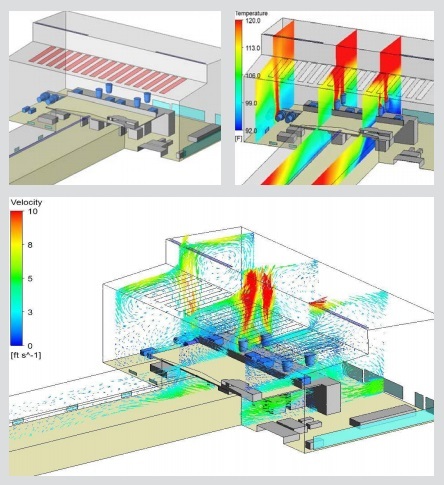 What are the considerations when designing an industrial ventilation system? Keeping excessive temperatures down. A facility may have minimum and maximum operating temperatures for optimum plant efficiency, for storage and processing of materials and to ensure comfortable working conditions for its staff. Providing ventilation whilst avoiding noise from breaking out – this can impact on the local environment. Providing ventilation in all weather conditions. Providing good indoor air quality, without excessive temperature, dust, fumes or odours. Ensuring that there is inlet air to provide sufficient over-pressure to ensure ventilation efficiency and to prevent dust and other external contaminates from infiltrating the building. Avoiding the risk of explosion if there is an explosive atmosphere. Protecting people, goods, machinery and buildings from the risk of heat stress, fire, smoke and enabling fire-fighting access. Good ventilation design can mitigate the above mentioned factors so that the facility can operate at maximum efficiency. Every building is different and a variety of factors affect its internal climate: location, orientation, the materials used in its construction, what processes are going on in the building, and what it is used for. All these factors influence its temperature, humidity, air movement, condensation, noise, and solar intensity. Our experts are able to design custom ventilation solutions that take all variables into account to create a comfortable and healthy environment, and over the years we have built an enviable track record. Click here to view our product range. Click here to view a selection of our projects. We have an in-depth knowledge of technologies and techniques across a wide spectrum. We have the experience to advise on the best combination of products and systems to achieve the desired effect and performance. We can provide heat and smoke simulations using the latest technologies, such as computational fluid dynamics (CFD). 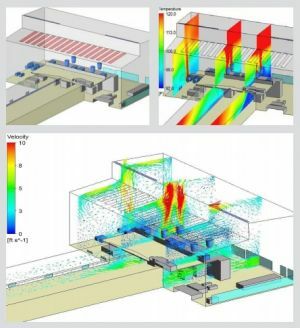 Our CFD tool enables us to predict flows and transfers of energy within a specific building in different situations, as well as to avoid unnecessary over-sizing of the ventilation system. When a building is refurbished, we are able to unlock considerable potential for improvements in energy performance, fire safety and appearance. Our experts can carry out detailed surveys to identify the necessary adaptations and upgrades to optimise the system's effectiveness and performance.